The finalists in the INSIDE World Festival of Interiors have been shortlisted for the World Interior of the Year 2014 award; the winner will be announced in October at an official ceremony at the Marina Bay Sands Hotel in Singapore. floornaturelive in Venice. Fundamentally Hong Kong? During the 14th international architecture exhibition in Venice 2014, #floornaturelive visited the Hong Kong installation called “Fundamentally Hong Kong? DeltaFour 1984-2044”. 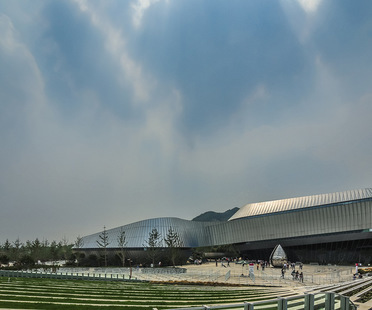 UNStudio designed the Theme Pavilion for World Horticultural Expo 2014, coming up in the Chinese city of Qingdao April through October 2014. #floornaturelive has united some impressions we collected at the 14°International Architecture Exhibition between Arsenale and Giardini, exploring the themes of the Biennale directed by Rem Koolhaas. Zaha Hadid Architects’ Jockey Club Innovation Tower has been completed. The new tower houses the School of Design of Polyù, Hong Kong Polytechnic, and the Club Design Institute Jockey for Social Innovation. The 14th Architecture Exhibition at the Biennale di Venezia will feature the second GREENHOUSE TALK: meetings and discussions focusing on key issues in the evolution of architecture. The Four Seasons Hotel Shenzen, in the city’s Futian district, with its high impact glass façade is a new attraction fitting perfectly into the architectural scene of the Chinese metropolis, only minutes away from Hong Kong.